Belldandy: Divine Goddess or Sexist Doormat? Aside from writing about shojo, one of the topics I’m really interested in is examining gender roles in anime and manga. One of the most polarizing character types throughout anime and manga is the yamato nadeshiko. A yamato nadeshiko is the ‘ideal traditional Japanese woman’ – someone who is modest, feminine, kind and domestic. When I think of the yamato nadeshiko archetype, the first character that comes to mind is Belldandy from the seinen series Ah! My Goddess. But as gender roles are becoming increasingly flexible, I’ve seen many people lash out against yamato nadeshiko-type characters as sexist doormats that are symbols of female repression – especially Belldandy. I’ve seen a lot of people debate about whether Belldandy is a doormat because she is so perfect. A major complaint against her character is that she is bound to live with Keiichi by a contract because he wished for her to live with him forever – and thus, she is ‘repressed.’ Jonathon Clements and Helen McCarthy, authors of The Anime Encyclopedia, criticize the story for positing “a boy who is pure of heart and gives him the perfect girlfriend, whose role seems to be to look pretty, cook and clean (462).” Many fans also find fault with the fact that Belldandy happily obliges to this arrangement, and hate that her staying with him is ‘justified’ by the fact that she later falls in love with him. Overall, I do find the yamato nadeshiko character type to be offensive, because it is a male fantasy that sets impossible standards for women. 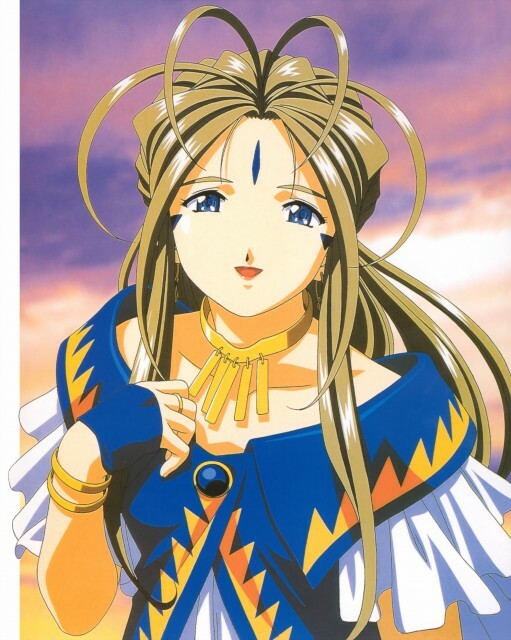 But personally, Belldandy has never bothered me much even though many consider her character to be anti-feminist. Yes, she is a bit too perfect – she can sing, is kind, beautiful and conveniently great at domestic chores (which she finds fun). And yes, she has powers and prominence yet chooses to stay at home and do the cooking (and I noticed she never eats any of it). But I think the reason I’m okay with the Belldandy character is that she plays perfect so well. I mean, she’s a goddess. If anyone was going to be motherly, kind, divine and perfect, it should be a goddess. But most importantly, she has an existence that’s separate from Keiichi – she has powers and a job as a goddess that have nothing to do with him (and frankly that he can’t understand). She has other relationships that are important to her, like with her sisters. Plus, the other females in the series are far from perfect or traditional – and some characters (like Sayoko) have a hard time believing that someone like Belldandy can even exist. I think the fact that not everyone sees Belldandy as the ‘ideal woman’ within the series itself helps me feel like Kosuke Fujishima, the creator of Ah! My Goddess, isn’t trying to argue that we should stick to traditional gender roles: rather, he’s presenting different types of femininity. Besides, there are other yamato nadeshiko characters that I find to be more sexist than Belldandy. The most aggravating yamato nadeshiko has to be Aoi Sakuraba from Ai Yori Aoshi – I wasn’t even able to make it five episodes into Ai Yori Aoshi because her character bothered me so much! When Aoi and her fiancé, Kaoru, were five-years-old, their parents arranged for them to marry in the future. But Kaoru decides to leave his wealthy family, and the arrangement is broken. Nevertheless, Aoi trains to become the perfect bride, and as soon as she turns eighteen (which is in the beginning of the series), she moves to Tokyo to find Kaoru so she can fulfill her dream (and their promise). They soon move in-together, and start a relationship. Personality-wise, Aoi is similar to Belldandy -she’s kind, shy, and feminine. The fact that Aoi trained to be the perfect bride is just creepy to me – I can imagine her at ten-years-old doing laundry muttering ‘must…be…a…perfect…wife!’ And the fact that she learned to become modest and great at domestic tasks because this is what she assumes all men want in a wife is just insulting to men. But what’s most bothersome about this is that Aoi has no real goals in life that don’t revolve around Kaoru, unlike Belldandy. Some people defend her character and point out that she does at least have a backbone because she defies her family to be with Kaoru. But the only times she loses her modest demeanor is for Kaoru, which shows that her entire life is based around this relationship. Basically, Aoi’s whole existence and personality is dependent on Kaoru, and that is truly disturbing and anti-feminist.